The official blog for MP Artworks, a fine art studio producing limited-edition ketubot (ketubahs) and wedding certificates, chuppot (chuppahs) and wedding canopies, fine art giclée prints, gifts for weddings, anniversaries and other special occasions, and more. Our main focus, however, is couples' ketubah and chuppah. MP Artworks has again upgraded its printing technology for ketubahs to stay on the cutting edge of wedding ketubah (and fine art) printmaking. Their newest giclée equipment continues to allow them to "print ketubahs to order" so they can easily (and affordably) customize and personalize them, but now these jewish wedding contracts will look even more brilliant and detailed. Sarasota, Florida (PRWeb) April 20, 2009 -- MP Artworks yet again upgraded their printing technology, keeping them on the cutting edge of ketubah (jewish wedding contract) printmaking. This means just another "first" for MP Artworks - first in 1996 to offer wedding ketubahs (or "ketubot," plural for ketubah) as giclée prints, first to offer "mix and match" ketubah designs and texts, first to offer a proof of personalized wedding ketubahs, first to offer custom options that are affordable, first to offer "sample" ketubahs so you can see it before you buy, and the first to offer a "digital" ketubah. With this upgraded technology in giclée printing, artist Micah Parker explains that the equipment for the whole chain of production is new. "We've switched from PC to Mac both in terms of our hardware and our imaging software. Apple's color profiles are truer-looking on the screen and have a larger color spectrum when printed. And we have just recently added two new large-format printers. This is definitely a case where bigger is better!" The resulting prints are much more vibrant and accurate, showing greater detail as well. Giclée printing is the newest technology for producing fine art prints. Like anything else, there are different levels of quality. A giclée is essentially an inkjet print, but there are differences from standard desktop inkjet prints. Typically, the printers are much larger, the imaging software used with the printer is quite expensive and very sophisticated, and special light-fast inks are used on the prints which, if kept out of the sun, will remain true for a long period of time. We've switched from PC to Mac both in terms of our hardware and our imaging software. Apple's color profiles are truer-looking on the screen and have a larger color spectrum when printed. And we have just recently added two new large-format printers. This is definitely a case where bigger is better! The main reason to consider a giclée ketubah for your wedding is flexibility. As a ketubah customer, you get more flexibility in customizing your ketubah, to make it more personal, since we print to order. look. We can very easily (and affordably) change the text and/or the design. And now, the print itself will be even more breathtaking. Umm, hi, we're in France, and we need another ketubah! Stressed Out Bride: "Ummm, Hi, MP Artworks? My name is Stressed Out Bride. We ordered our ketubah from you. We got it weeks ago and it was gorgeous, just beautiful, but there's a problem." MP Artworks: "Problem? What can we do for you?" Stressed Out Bride:"Well, my fiance and I are getting married in France, and we just got here and noticed that we don't have our ketubah! We had it with my dress and my fiance's tux when we boarded the first plane in New York, but now we've lost it. Can you help us? Even if we could afford it, we don't have time for international service. The wedding is soon! 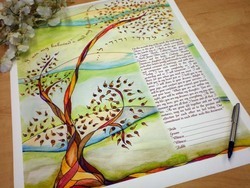 Is there any way you can email us our ketubah?" MP Artworks: "Of course! MP Artworks to the Rescue!" OK, maybe that wasn't exactly how it went, but you get the idea. This is a real story of one of the real couples who recently bought their ketubah from us. It's just one of the crazy stories we hear all the time. In this instance, we were able to email her both a copy of her text only as well as a pdf of the image so that they could either just print out the text to have something to sign or, if they could finagle it to find a good fine art printer, they could actually print out their ketubah. If not, when they get back, we can reprint their ketubah for them and even "marry" (if you'll excuse the pun) the signatures with their ketubah so everything's on one, beautiful, archival document. In all of these cases, the couple could take advantage of the fact that we print fine art giclees, so that we could literally "reprint" their ketubah for a small fee without any fuss. Not a bad service, eh? What's an Interfaith Couple To Do? There are more and more interfaith couples getting married every day, where one partner is Jewish and the other is not. Often times, the Jewish partner wants to incorporate the Jewish traditions into the wedding, even if they do not have the exact significance in an interfaith context. The ketubah is one such item. OK, so technically it may not be considered a "ketubah" by many, but an interfaith ketubah will serve the purpose of honoring a Jewish wedding tradition and commemorating your vows in what may be your first fine art print that will hang in your home and remind you of that most special day, forever! So, how do you find this so-called "Interfaith ketubah"?? It's simple. At MP Artworks, you can pair any text with any design, so start by choosing a design that inspires you both. You might even want a design that incorporates the ethnicity or background of the other person, such as our Celtic Tree of Life design by Claire Carter, or Tropical Paradise by Michele Rainer, or Impression:Sunrise by Micah Parker (Maine). Then look over our interfaith texts and see what works best for you (remember - you can always modify ours or use your own custom text). That's it - you've now created YOUR perfect "Interfaith Ketubah." Good luck! Let us know if you have any questions!! OK, so you say you're just tired of all the traditional ketubah art, that you can't find a ketubah that doesn't look like a 70's stained glass window? We gotcha covered! Check out these new pieces from Michelle Dwyer. There are 3 new ketubah pieces, each in several color variations, and I think they just so beautifully combine whimsical beauty with romance. Not sugar-sticky, soap opera romance, but the slow burn that fuels real everlasting love. Heck, these pieces are just so fun they can't help but make you smile! 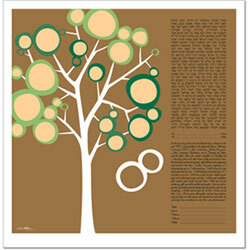 And see our site for all of Michelle's ketubah designs. Having Fun, Doing Good, Cute Kitties - Not a Bad Night! At the end of February, MP Artworks held its annual office party (yes, we hold ours in February - actually, it's usually in January - we just like to be absolutely clear it's not a Xmas party but just an annual office-fest!) and we decided to do something different. Now, there's just a few of us at the office - Micah and me, Esta (our General Manager and overall "Quarterback"), KC (or as we call him, "Captain Chat," since he's the one who spends most of his time talking to clients), and Tim (Production Manager or, as we prefer, "The Prince of Printmaking" since Tim's the one who does all of the custom work and prints out all of our ketubot and chuppot). It just happened that a local cat shelter in Sarasota, the Cat Depot, was having their annual Cat'sino Night around the time of our scheduled office party, and we all agreed that would be a fun way to spend an evening. There was great food (including one of those chocolate fountains where you dip fruit and marshmallows into a lava flow of chocolate - seriously delicious and extremely perfect for our chocolate-obsessed office), dancing, and casino tables. You played for casino tickets and at the end of the night put your tickets in the raffle prize you wanted. Plus they shot up pictures of cute cats and kittens all night. Well, we had a terrific night together. Overall the company donated $1,500 to the Cat Depot, a cause near and dear to our hearts (we have 4 cats at home). Tim and his wife, Lori, found a table with killer luck, and KC's daughter and son-in-law were able to join us to learn KC's long-held blackjack secrets. And when the raffles were called, our little office (with 6 people there total) won 3 prizes. Here's a pic of us with our loot we won! A terrific time for a terrific cause. Gotta love that. Introducing our newest artist, Doris Katz! We are really excited to introduce our newest ketuba artist, Doris Katz. Doris was a big Mark Rothko fan and painted in his iconic style of large, transcendent fields of color. These palettes form the background against which the ketubah text is laid. They are beautiful on their own (available as fine art, coming soon!) and of course when a Doris Katz ketubah graces the walls, it will add sophisticated style to any newlywed's home! We invite you to peruse Doris's gallery of ketubot here!